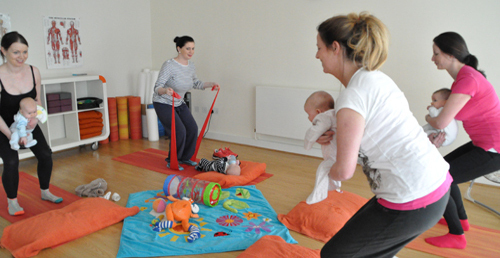 Mother and Baby Pilates Classes - This is a 4-week Paediatic Physiolates Programme, developed by Chartered Physiotherapist Deborah Fernandes with the aim of educating parents in common paediatric conditions while safely returning to exercise with the added benefit of also promoting emotional recovery. Bronchiolitis and Respiratory Physiotherapy for babies Flat head and neck mobility: Physiotherapy for Torticollis Baby Developmental Milestones. Strength & tone with gentle Pilates exercises Stretches with gentle Yoga postures Cardio-fitness with dancing exercises Gentle exercises for baby Set in a cosy and relaxed environment, classes are small and you can feed, change or soothe your baby whenever the need arises - your baby is the boss! Babies are welcome from 6 weeks until crawling. Maximum 6 mums & babies.